Just Thinking, Just Talking, Just……. The silver point drawing did not work….the surface is too rough. 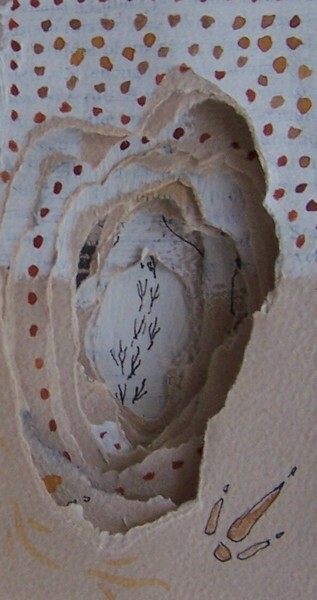 But the watercolors hold a line on the gessoed surface. I am just picking up things at random around the studio. Things small enough to sit in front of me. This is the first twelve inches and so far stick of willow, a rock, a cork, an awl that I use for etching, an irresistible little bamboo brush and a stone clothed in cane toad hide with a strip of rawhide. I had to tell myself to stop or the whole five feet would be filled in one day. When I finish this strip I will roll it up into a bottle and cork it with the addition of wax. Then I will have to find someone to put it in the ocean for me. It would do little good to drop it in a creek or body of water in western North Carolina where it would smash against a rock and ruin the images as it returned to paper pulp. No, I need the ocean. I need to know it took time to get somewhere. 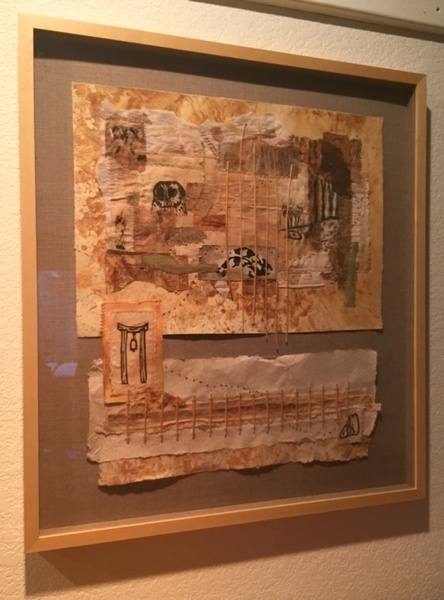 But in the meantime I will keep making these scrolls of the bits of things of my life…my artist life. And one day they will ride a wave to shore and someone will see a bit of me when I needed to remind myself of who I am. And, please do not tell me that the ocean is full of the unwanted already. I don’t want to hear it. 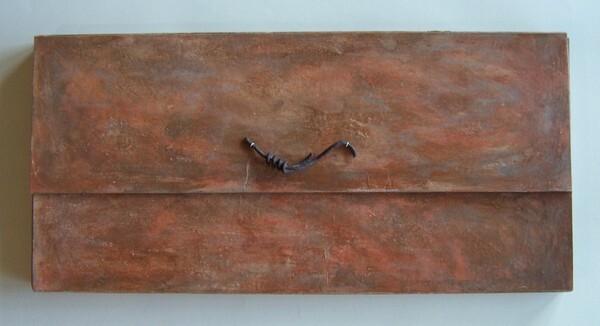 The wine bottle will turn into beach glass and the scroll of images will feed the imagination of the finder. There will not be any contact information on the scroll, but maybe a story of why. It is the one small piece of magic that I can do for now. Isn’t that enough for anyone? I put that picture in there because no one wants to just look at words. And I needed to change the subject. Here is a message and my response from this week regarding the last blog. 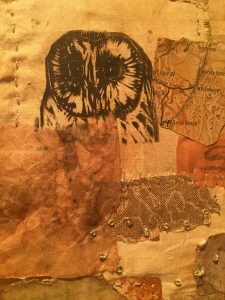 And here is another thing I wrote this week in response to Robyn Gorden’s post of poetry and pictures. to rest and breathe here. It has been a contemplative week. The dreary days, the waiting for something that I have no idea about, the looking up the driveway and then wishing I hadn’t. We all have days like that. And if we don’t, we should. Someone needs to just remind us once in awhile that we need to just rest and breathe, rest and breathe. And more pictures for the patient reader while I get on to planning my trip to Australia and thinking of their bright warm sunny days and sunny students. I need to get on with applying for my visa to teach there. I need to check on my hotel in Melbourne. I need to get a box of interesting things in the mail to Australia to avoid having to haul them through airports. I am good. I have a smile on my face now. Here are some pictures as promised. Til next time. Now off to share a beer with Lee. I know, I know, I just did a blog yesterday. But something about how we leave things behind and how I am going to do some drawings on a long scroll to put in a wine bottle made me remember someone. K. Lee Manuel. One of the few California based artists who started the Art to Wear movement of the 70s. 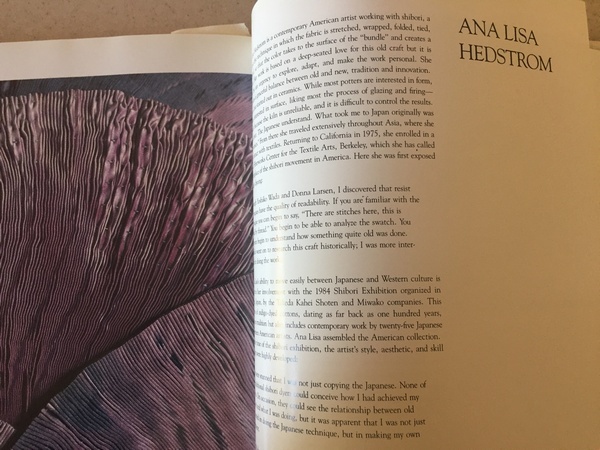 Long after she was featured in this iconic book I read somewhere that she would paint feathers and leave them in places around the world….just drop them and then watch from some hidden place. And when someone picked a feather up, they looked up in hopes of seeing the bird it came from. She loved bringing that bit of magic into someone’s life, someone off in distant places where magic was still possible. Of course, unlike now, magic was more possible in 80s and 90s. We are too tainted now and if someone found one of her feathers they would likely google it up with a photo and reaffirm their belief that it was not even remotely from a real bird. 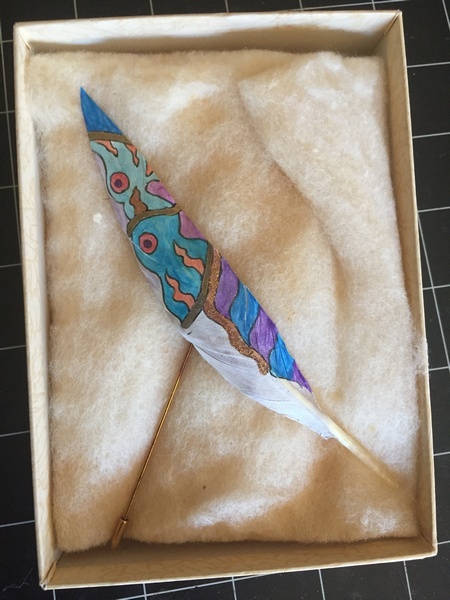 Anyway, K Lee Manuel was magic for me and years later (after I came across her name in the art to wear world) I had a chance to purchase one of her feathers that she had turned into a pin. Here it is. I still have it! Can you imagine coming across this on a path in Central Park or along an Amazon trail? Or on the steps to a mosque in India? How could you not look up! So thinking of her and others who were such pioneers in the field of Art to Wear, I dug out my book. A book that in 1986 when it was published took every dime I could save to afford its cost of $98 before tax. They ended up having to do a second printing of this luscious book that must weigh close to ten pounds. 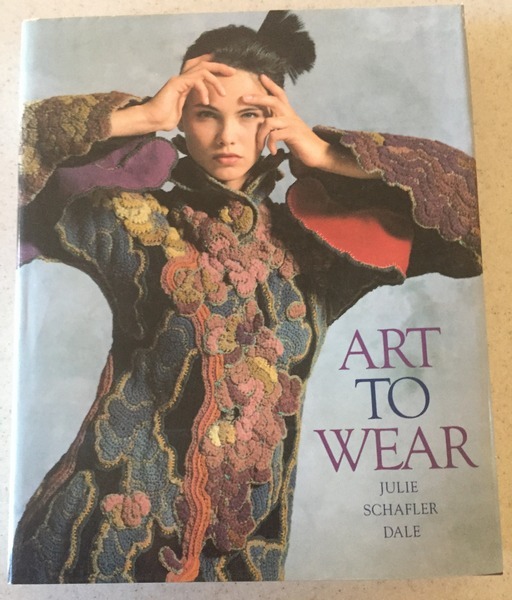 I drooled through this book for many years and worked at making my own Art to Wear. And almost all those pieces that did not end up lost to customs in Australia ended up decorating the dining room chairs of a friend in Brisbane, Queensland. I think Peter still picks the one he wants to wear to art openings with his sari. And another aside, the author Julie Dale’s husband is Jim Dale, the voice actor that took several Emmys for his portrayal of all the Harry Potter character voices on the compact discs. Lee and I found him magic to listen to and I would buy the Potter stories in this form rather than book form…just to be read to. We would sit on the couch and keep ourselves to just a couple of chapters a night. So here are some of the people from this book. K. Lee Manuel. Feathers and leather in her hay day. Jean Williams Cacicedo who just a few years ago I shared a bottle of scotch with when we taught at the same venue and relived these early days of Art to Wear. Tim Harding who invented the slashed clothing that was layered cloth and later cut into and washed and washed to fray the edges. I did several vests like this and only one full length coat. The best material I could find was cheap and loosely woven cottons from India in very garish colors. It really fluffed up nicely. Somewhere an Australian aboriginal girl might still have hers. And Ana Lisa Hedstrom. I took a workshop on various discharges from her in the 90s and some of the lesson pieces ended up on a jacket that I gave to David Baker, a favorite masseuse here in Brasstown. 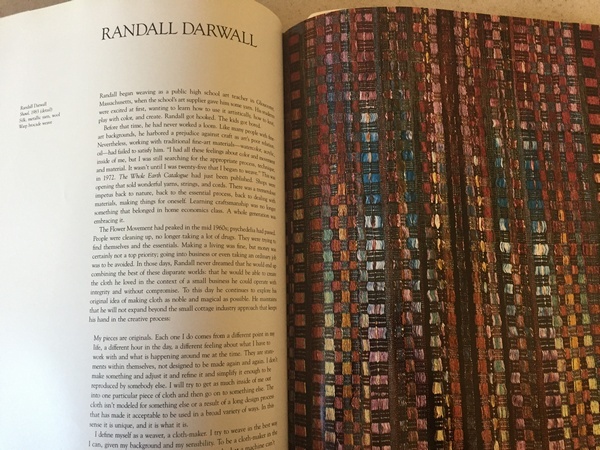 And Randall Darwall. When I bought a large shawl from him in the late 90s, I went up to my hotel room, took off all my clothes and laid under all that rainbow dyed silk. I no longer go places I could wear it, but might just treat myself to a good lie down with it. 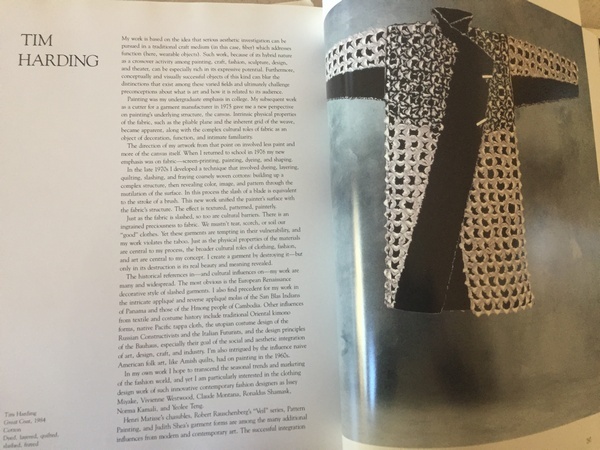 When out in San Jose, California in 1991 for an international textile conference, a friend and I went up to San Francisco to visit the Obiko gallery where the best of the best Art to Wear could be purchased. Or at the very least fondled. I came away with Sandra Obiko’s business card. But on the way into the gallery I met a homeless woman selling hand made jewelry. Her name was Dolores. I bought two pieces, chunky with several African trade beads. Soon after I got home I made a small figure of her, called it Dolores, filled her body with cheap African clay beads to give her some weight and adorned her with several beaded necklaces. I kept Dolores for over twenty-five years….only parted with her last year. Anyway here is Sandra Obiko’s card. 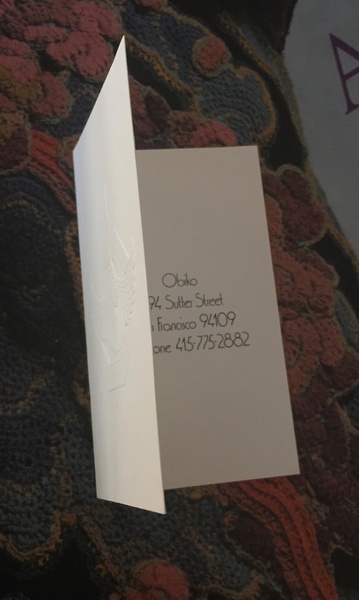 It has a beautiful embossed cover. When we were in the gallery an older woman, about my age now, came in and tried on a necklace. It was very much of its time….weighted with special tokens spaced out just right. She bought it and I wanted so much to be her, to have that necklace that I had just touched and let go when I saw the price of near $1,000 as I recall. I watched her wear it out into the San Francisco sunlight and was so envious. I hope a daughter or grand daughter is wearing it now. 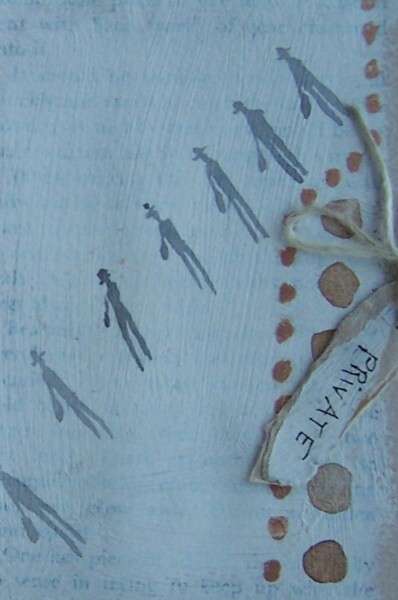 But in looking up K Lee Manuel and the story I read about her leaving feathers around, I came across a downloadable video of Sandra Obiko’s gallery….http://www.textileartscouncil.org/obiko-archive/. It is so much fun to flip through all the artists she carried. 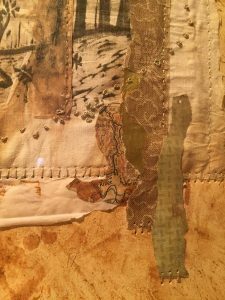 One of them that I was so glad to see because his work is not in Dale’s book is John Marshall with his rice paste Japanese colored cloth made into clothing. 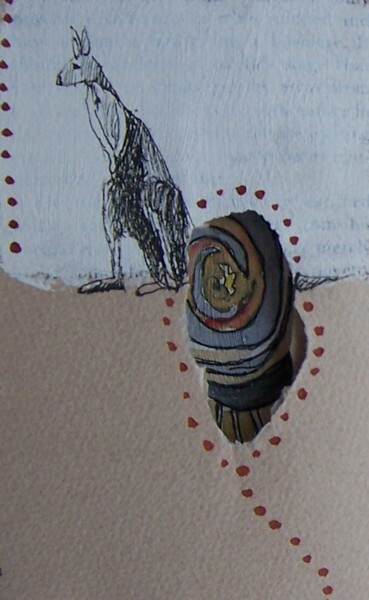 He and I were doing a fiber market many years ago and he wanted one of my little pins of a tiny old man in textile clothing with a twig for a body. He traded me a swatch of his cloth, about a quarter meter for it. I still have a bit of that cloth. 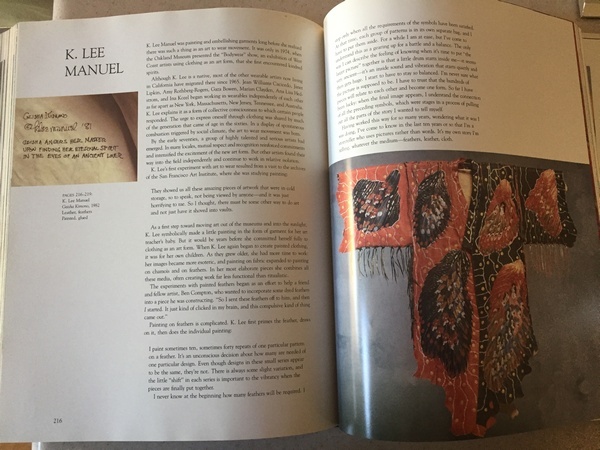 I never thought when I bought that book in 1986 that over the following years I would share a bottle of scotch with one, trade goods with another, buy a piece of artwork (feather) made by one, take a workshop with another, and purchase a cloth that made me take my clothes off from yet another. The story of K Lee Manuel and her generous gift to the world via her magic feathers must have been written in Ornament magazine. 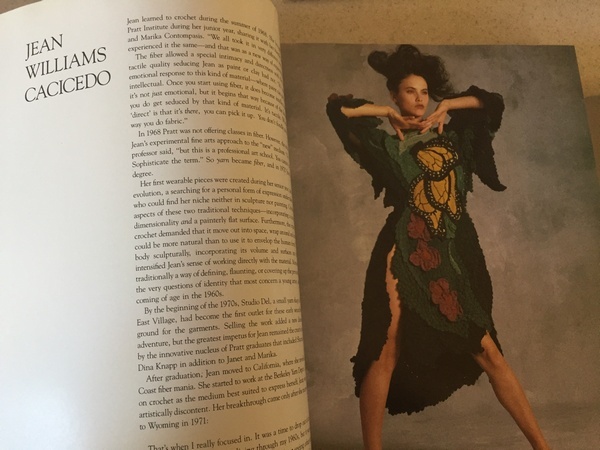 It was the inspiration for so many of us enamored with the whole idea of Art to Wear and although I remember the story well, I do not remember the source. 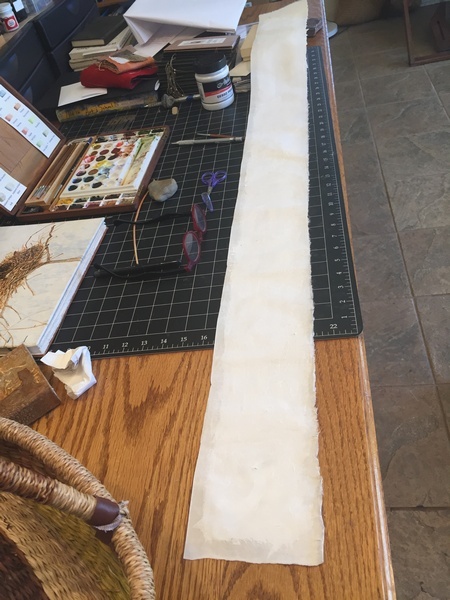 But aside from all that getting side tracked, I cut my first five foot piece of paper today to draw/paint on to put in a bottle. The paper was too porous for my watercolors, so I have gessoed the length of it and might now do small silver point drawings instead of painting. I will show how far I get next time. In the meantime, Lee asked me if I wanted to go to the dump today. We took all the trash from his truck and put it in my car. This may mean that he has decided to no longer drive. I hope so as he does not use a phone and going to the trash once a week was the only time he drove. We finished that excursion with him telling me, “Thank you for doing that.” I told him, “No worries, it was fun……as long as you do the dumping into the bins.” Then it was lunch….hot dog for him, soup for me and a shared beer. Til next week or whenever. 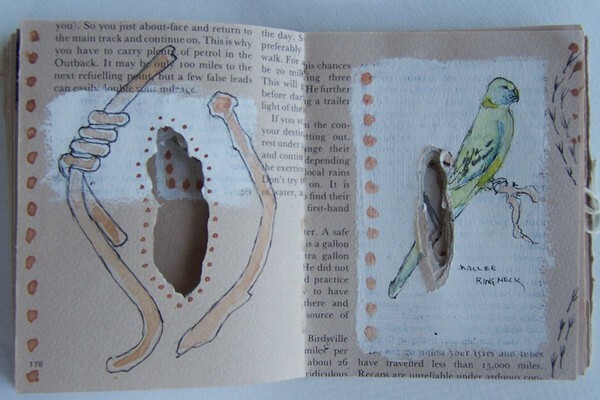 This is a double page from my sketch book made from an altered old library book on traveling Australia. 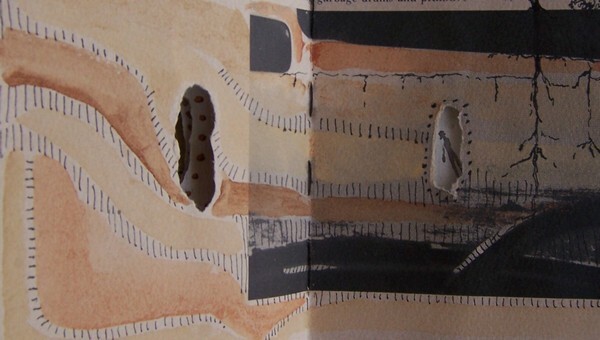 It now resides in the Queensland State Library Artists Book Collection. Every once in a while I hear from someone who asked to peruse it. It is nice to remember that visit to Lake Mungo and how so many of us were there to make some sort of recording of our reactions to such an extraordinary place. So today while looking through the images of artwork, I selected a few of the pages to show here. I used the soils of Australia that had been turned into watercolors to mark pages as well as my trusty travel watercolor set. I tied the last few pages closed and labeled them “private”. I remember that in those pages I wrote about the “Imposed Sacredness” that people assign to places that really are just places that developed through time and circumstances of Nature. I do not know why there is such a need for people to name something in order for it to exist and have meaning. Silly really. 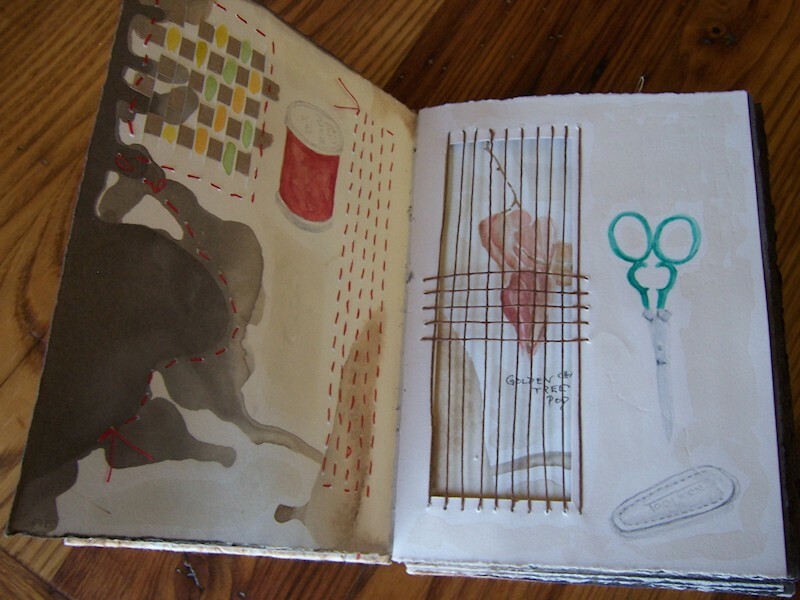 I put this next image in from the book just because of the wrapped wire drawing on the left. 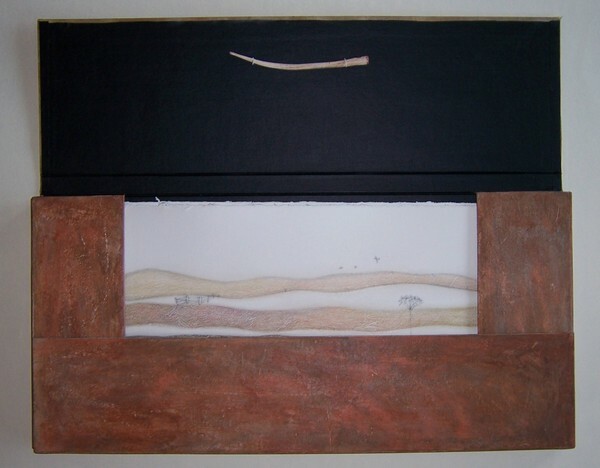 It became the “handle” for opening a portfolio that I titled “Imposed Sacredness” that was exhibited in 2009 with other artists’ works on Lake Mungo. 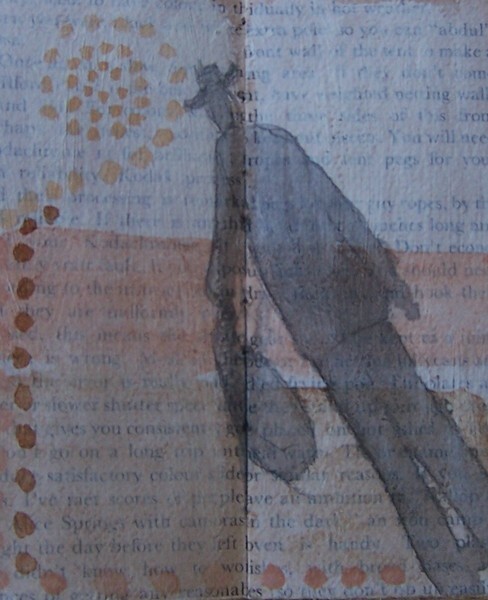 I made six collographs with graphite drawings in an attempt to capture the essence of that place. Here they are in the order they appeared in the case. 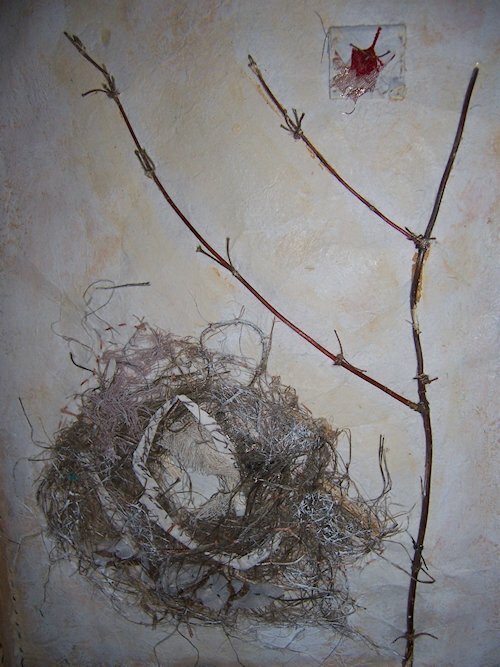 The piece sold during the exhibition and then sold from that buyer to another person who was a student, friend and inspiration. I hope she passes it on to someone else. I impressed a sheet of masonite, still wet from layers of gesso, with bits of cloth, sticks, whatever would make a permanent mark. Then the large piece was cut with a band saw into several strips with wavy sides. 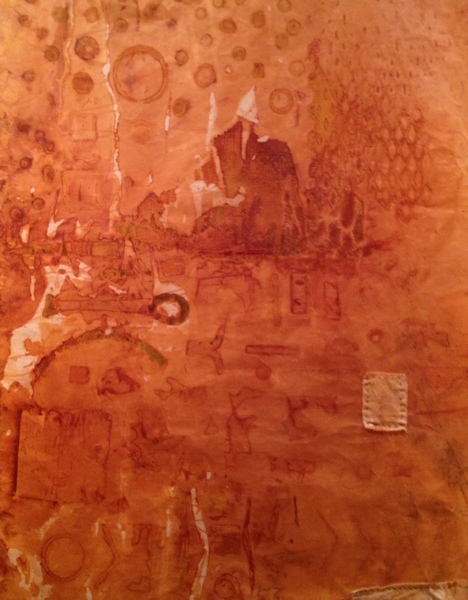 They went through the etching press with dampened Rives BFK paper and heavy felts. Once the impressions were deep into the paper and dried thoroughly, I did my graphite drawings and used colored pencils to shade in the embossed landlines. I even sanded the graphite to bury it deep into the papers fibers. 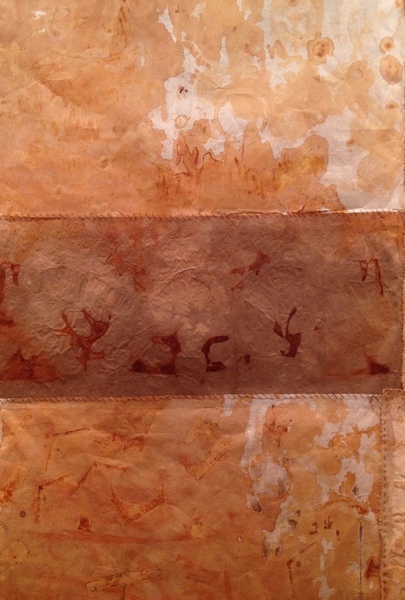 I liked how the embossed sheets gave a sense of buried land and the life that lives above it. Apostle birds are something I could watch all day, the way they busy themselves minding one another’s business. Not one can get away from the others for more than a minute without the others following and badgering him to stay in the group. I still have those collograph strips. Maybe I should use them again and capture the depths of where I live. And then what? That is the question that keeps coming up each time I think I should do something over there across the hall in the studio. A studio all cleaned up from the holidays for the art group meeting last Sunday that is now postponed for two weeks. Here is an idea. Maybe I should get a very long but narrow strip of paper and every day draw something from here. Just a flow of images. Then maybe roll it up tight and put it in a bottle, a wine bottle. And then do it again, and again….. I will start by cutting a long strip of thin kozo and then see where that leads. I can do this. It will be easy. Almost as easy as getting an empty wine bottle. By next week I should have something to show you. Now I am off to check on Lee and see what he would like to do next. We are all tired of the rain here in western North Carolina. Too much grey skies. Too much wet. So inside in the the studio I finished to large collage piece, The Roads. Here it is hanging ready to show art group on Sunday. Too much reflection to shoot from the front. And some details. The color here is more accurate. And speaking of the color, mostly the rust color, got me to thinking of these large panels that were part of the Expedition to Elsewhere: the Evidence exhibit a few years ago. I will dig them out and try stitching into them. 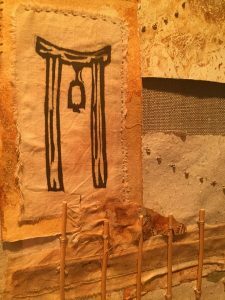 I notice that I already have a patch of fabric sewn on and each is sewn to a rusted heavy cotton sleeve to hang on the tobacco stakes….so why not just keep going. Each one is about three feet across and four feet long. It would give me something to do without thinking. It is hard for me to do thinking any more. 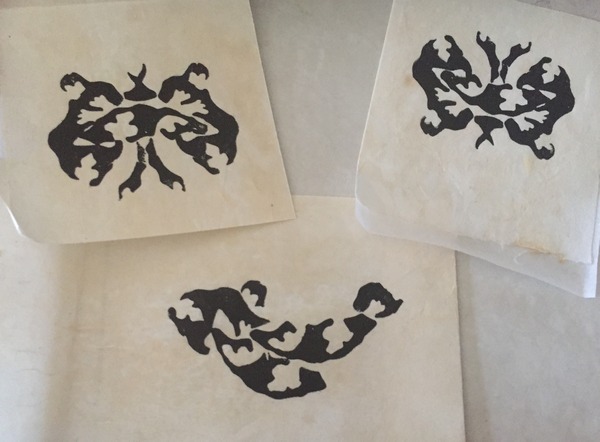 The small prints below I made last week using blocks made from the negative spaces that fell to the floor as an old friend cut out his animals (mostly possums) on a scroll saw. He used a cheap 1/8″ plywood, drilled a hole near the top, slapped some varnish on them and sold them as Christmas tree decorations. I would pick up the bits and pieces and move them around on a piece of pine board to make a design. Then glue them in place, ink them up and make prints. If I turned them upside down, each butterfly and fish became two different critters. I think I was born trying to make something from nothing. I do know we were raised that way. We were children of the survivors of the Great Depression of the 30s. Every scrap gets a good examination before going into the trash. And when going through all my relief blocks I found these. Fun to print them again and remember the old fellow. 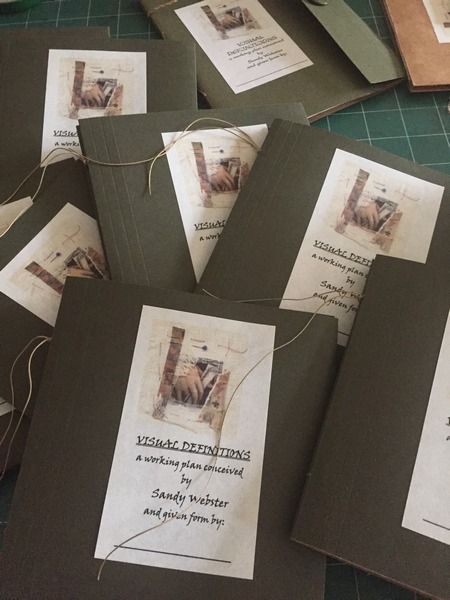 Also I just finished (almost) all of the work books for my master’s class in Australia. I only need to add beads to the strings and they are finished. They are a revival of an idea I had over ten years ago to jump start thinking….thinking of what matters to the maker. I called it Visual Definitions and since my class is titled, “Seeking the Visual”, I thought it would be fun to revive the idea. I think I will have to mail a box down under as there is getting to be too much to be schlepping in the airports. On another somewhat unrelated thought….. While working in the studio I turn on Pandora to the Lyle Lovett channel. And there is also music from similar artists. So far I am thinking that as much as I like Lyle Lovett’s music, I could run off with Keb Mo or Willie Nelson. Lyle Lovett just has too much of other musicians to make his music….too much brass….too much piano….to much….. Even though that “Pony on a Boat” has always conjured up some of the best images. Actually I even tried making a pony in a boat because of that song. Suffice it to say that the boat was salvageable but the pony died in the trash. But Keb Mo is just plain good to listen to. I could move next door to him just to hear him hum if I did not have other things to do right now. I don’t have one lick of musical talent in my bones, but that fellow makes me feel good, makes me smile, makes me want to fix him a nice supper for all the relatable lyrics and smooth delivery. It might all sound a bit silly but honestly on a dreary day, trying to thread a needle, wondering why bother, making a mess for no good reason that you can think of…..and then turning on your iphone to Pandora and the lyle Lovett channel just so you can hear Keb Mo and Willie Nelson take you somewhere else, it is not a bad thing. Now I am going to go put the beads on those books and call it a day.